Hmmm, that seem to be all available only from those open source sites that are available only via https. I could try downloading them on another PC and then transfer them to my own computer... or is the power-button problem already fixed in v1.3? Nope, the problem is not fixed. btw, I uploaded DSiMenu++, since you are unable to access the site for it. I've got an issue where the installer always says I've "discovered unknown camera chip IDs" when I go to install unlaunch. It says to check for a newer version, but I am already using 1.3. Does anyone know what is going on? When saying "using 1.3" do you mean that you already installed 1.3 successfully, or that you are trying to install 1.3? I am trying to install 1.3 yes, however I'm not sure what is relevant to me in the post that you linked. Oh, sorry, asking if you were "trying to install" was misleading. I meant this: If you are "trying to upgrade from an older unlaunch version" then the problem might be caused by a glitch in the older unlaunch version (and the linked post shows some workarounds). The problem there is that old unlaunch didn't empty the cache when loading bootcode.dsi (if your bootcode.dsi file contains the new unlaunch version, then the new version may fail to detect the cameras or run into other weird effects). What are you using for using for installing unlaunch? Some exploit like Flipnote or Sudokuhax? With some exploits it may be also helpful to insert hbmenu or wifiboot into the bootchain (ie. load one of that tools as boot.nds, and then use that tool to load the unlaunch installer). Going by that values your console would contain only one working camera instead of two. But I doubt that that's true (unless you say that your hinge is broken and there are some broken cables dangling out of the console). I think it's more likely that the detection went wrong; as happening when trying to upgrade from 1.2 to 1.3, which sometimes causes camera values FFFF,FFFF,FF,FF to be displayed. Your values are a bit different, but my first guess was that it's nethertheless related to the same issue. Power button doesn't work because the IRQ isn't enabled in GPIO registers. From what I can see, the Launcher seems to enable that for you (and I'll do so in next unlaunch version, too). Additionally, commercial games seem to also enable the IRQ themselves (and should be perfectly legit if do that in homebrew titles too, ie. write [4004C02h]=4000h, so you won't need to wait for next update and/or want to have your program working like official games). Touchscreen doesn't work, too (as far as I remember you mentioned that somewhere, too). One think that looks wrong is your cartheader entry [1BFh], that's setting the touchscreen to NDS mode, or is that intended as so? Once when it's in NDS mode, I don't know of way to switch touchscreen back DSi mode (except by issueing a Reset with complete reboot). It's not an upgrade at all, I'm trying to install unlaunch for the first time on this console. I guess it's possible that one of the cameras has been disconnected, I have had to take it apart once or twice due to some screen issues. The camera app does crash when I try to open the camera so that would make sense. I am trying to install using flipnote, which is already booting hbmenu which I am using to open the unlaunch installer. Ah, okay, if the official DSi camera tool doesn't work either then it's apparently really a hardware issue, not a bug in unlaunch. You could install unlaunch v0.8 (which didn't have the camera check), I think/hope that v1.3 is a bit more stable when v0.8, but v0.8 seems to have worked okay for most or all people, so it should be quite safe, too. Or you could install v1.3 manually (eg. via hardmod). Or I could maybe add something for detecting your broken hardware, and let it pass to the installer for that specific situation. Might be worth opening the console and check what's wrong with it. But the ribbon cables for the two cameras are both connected to the same connector (P9), and (apart from the camera LED) both cameras are sharing the exact same signals, so the issue is probably not caused by a loose connector (as that would affect both cameras). I would be afraid that it's a broken ribbon cable, or some damage to the actual camera, ie. things that are quite impossible to repair (unless it's something simple like some metal junk touching the camera contacts & producing a shortcut; or maybe a blown fuse, if there are any fuses in there). Quite possible that you would need to replace the whole ribbon cables with attached cameras and connector. Yeah, libnds should probably support that, at least Nintendo is apparently supporting DSi titles to use NDS-TSC mode (don't know if they've every released any titles doing that though). On the other hand, switching to NDS-TSC mode just requires the following code (which will also fix the power button issue) (the init list & send list functions are found in the dsloader.a22 source code file in wifiboot.zip available on the unlaunch webpage) (for NDS titles that do not have an actual DSi header, make sure that you set dsi header [1BCh] to 00000000h). Last edited by nocash on Sun Aug 12, 2018 10:31 am, edited 1 time in total. I first modded the dsi when the 0.9 version was out, even if i didn't install it because of the various issues and used the 0.8, later i tried installing the 0.9 and noticed it wasn't booting, after that i tried installing some older versions of unlaunch and i installed the 0.7 and the 0.6, and checked if they were working or not, the 0.6 did, but i then returned to the 0.8, i have 2 nand backups i'm testing with no$gba. The first from when i reported the issue in this forum and you told me to check (that backup had unlaunch 0.8 installed), the second when the 1.2 came out after it didn't boot (that had unlaunch 1.2 installed) on both the backups, both the 1.2 and 1.3 works. I installed the 1.3 on both the backups from no$gba. As for the files in the backup, they're there, both the app and title tmd, with the correct size. Thanks for the screenshots. Yes, looks as if you really have no$gba configured as needed. I am running out of ideas why it isn't working the same way on real hardware. Except, you could try to dump CURRENT eMMC content (as far as I understand you've installed v1.3 independently on hardware and in no$gba, so the dump may be still slightly different than real hardware). If you had v0.9 installed first, then the launcher files were already write-protected (so later use of v0.6 won't cause any harm). Did you try to hold down button Y in v1.3 to skip wifi init (or both Y+A, if you have sd card inserted)? Maybe that helps, though I wouldn't know why, unless you have some different wifi hardware than most people. Maybe it's really time to look at the mainboard and chipset. Aside from different wifi boards, there seem to be different BPTWL chips, and different sound/touchscreen controllers. Well, or I could make a version with additional boot status messages, or with blank red/green/blue screens during the patched-launcher boot stages. That'd help to find out where it's hanging exactly. Ah, and did you try hiyacfw? As far as I know, that's also booting into the official launcher, with similar patches as in unlaunch. Does that hang, too? PS. I do currently have firmeware v1.4E on my console, and tested v1.4.5E only in no$gba, so I didn't check if v1.4.5E would hang on my console, too. But I guess a lot of other people have tested that and it's working without problems... If somebody has firmware v1.4.5E and unlaunch v1.3 installed: Could you test/confirm if it's working or hanging (when ejecting the SD card, or holding down button A during boot)? Tested all those various things, but 1.3 is beheaving as the same way as 1.2, so cannot acess teh system nand, via unlaunch, or the sdnand via hiya cfw. There's still also the issue with games with wifi capabilities that are still not booting with b pressed, while the other are. Those games are pokemon platinum, pokemon white and yugioh gx spirit caller. the ones that boot instead are mario bros, lotr aragorn's quest and transformers the dark side of the moon autobots. Also i have a flashcard with wifi capabilities, with b pressed it boots, but as soon as i enter the wifi settings it freezes on a black screen. 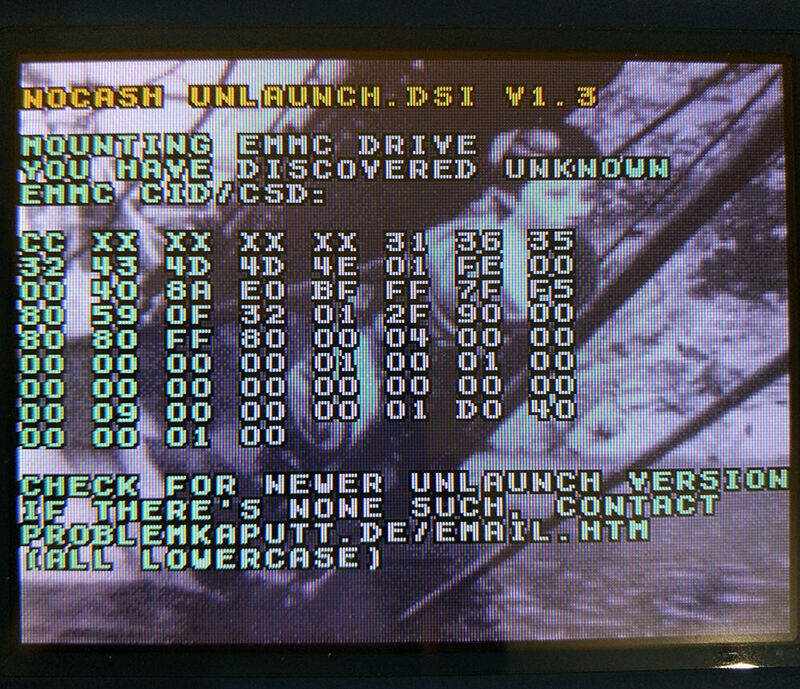 After several emails with nocash about unkown emmc/cid errors with unlaunch, he asked me to upload a picture of my nand here. And, about a hour later after receiving that values, I got screenshot with similar values from somebody else: https://i.imgur.com/embuZyj.jpg (with same values as above, except with date code CC instead of 1D in first byte). That chips are almost same as this one viewtopic.php?f=23&t=17581&start=15#p222497 discovered a few weeks ago. The difference (apart from date code) is the 6th byte of the CID being 31h instead of 30h. That byte is supposed to contain the chip revision number. The values are looking like ASCII for rev1 and rev0... although going by official MMC specs they suppose to be BCD values, with 31h and 30h meaning rev3.1 and rev3.0. Anyways, they are different revisions. Ah, and one reason for mentioning those difference here is that people without Flipnote will often need to brute-force their CID before installing code on the DSi console, so the above will help them to find out which values they are searching for. Just looking at the chip photo, I can't see anything indicating the revision number on them. The first lines with "ST, NAND02G, AH0LZC5" are same, the next line contains some different letters/digits, and the last 3 digits in last line are also different (those might be a YWW date code with year/week values, but, if so, then the YWW value on the chip is several weeks older than the month/year value in the CID). Last edited by nocash on Mon Aug 13, 2018 6:48 pm, edited 1 time in total.